For Art 40 Basel/Art Statements, Patricia Dauder (*1973, Barcelona) presents a project with three new works: one drawing, Overlapping #6 and two 16mm films Sporadic and Flow. In these works she experiments with the representation and perception of the concept of endless space and time as explored through different materialities: paper and film. The three pieces may function as individual units but they are directly linked one to another. Overlapping #6 (2009) is a drawing consisting of semitransparent overlapping sheets of paper. The basic construction is a few basic geometrical forms, squares, rectangles, or straight lines. This configures a puzzle structure with various spatial orders, different planes within the same image. Over the net strucrure underneath, a radial core expands excentrically with coloured or grey modules on the sides. The border and depth of the drawing composition are irregular. There are no limits, no beginning or end, no front or back, left or right. There is no hierarchic point of view from which to look at it. Its multiple layers, and densities gives the composition a threedimensional quality. Overlapping #6 vaguely reminds of an architectural plan, but it is essentially a mental projected space which simultaneously pulls the viewer in and back out. Sporadic (2009) is a black and white film showing images of architectural sites, parts of buildings in the process of being constructed, whose inner structure is open and visible. The film has shots ranging from wide-angle to close-ups. The sequence of images is based upon successive zooming in and out, so the viewer is constantly and gradually entering and exiting the building structure at a rather mechanical pulse, with no transitions. Neither the camera or the object move, there is little evidence indicating we are watching a film instead of a sequence stills. Despite the apparent stillness, some sort of motion is created. The viewer is somehow drawn to fill in the gaps, like in a puzzle with missing pieces. The film becomes a space where we move in visually and mentally, where an altered perception is created, that of an endless space contracting and expanding. 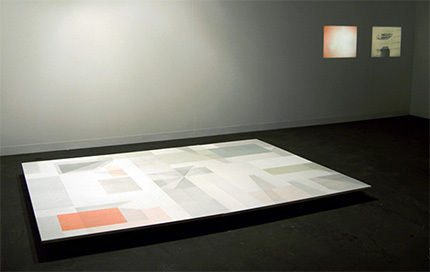 In contrast to this work, and projected parallel to it, on the same wall, Flow (2009) is shot in colour. The film shows glittering reflections of light on the surface of moving stagnant water. And a succession of light and colour transitions at dawn compressed in time. The different images flow smoothly dissolving one into the next, in a sort of continued light stream, that gradually darkens and lightens up. A sense of image instability, some sort of hypnotic flow is created. The three works presented in the booth seem to be unstable, in some sort of constant motion. The installation favours that the observer’s view is shifted from one piece to the next. None of the images show clear definition. Their source may be recognized, but the information given is intentionally fragmented and partly hidden. They all share a quality of uncompleteness: water, light, unfinished architectural constructions, spatial extensions, they all seem to be in a latent condition, eager to grow, diminish or transform.